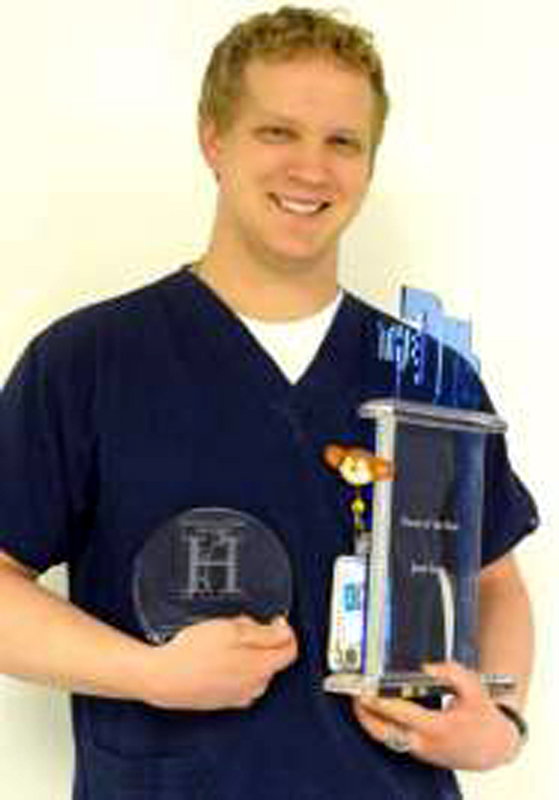 Jared Axen, nurse at Henry Mayo Newhall Memorial Hospital has received repeated recognition for the unique way he ministers to his patients, including the Southern California Hospital Hero Award in November 2012. Home-schooled from Kindergarten to 12th grade in the Santa Clarita Valley, Axen has always had a passion for singing. He performed internationally with choirs in high school and received an Associates Degree in Music at College of the Canyons and classical training from a vocal coach at The Master’s College. In spite of all of this, Axen decided to make the transition to nursing, because he felt there were more ways to use his art than just as a performer. Jared began singing to his patients almost by accident. They would hear him singing to himself as he performed his duties and ask him to come in and sing for them. Soon it became a regular occurrence. Axen tell the story of one patient who was admitted to the hospital repeatedly. Whenever she was there, she asked that he come and sing for her. The music had such an impact on her and her family’s life, that when she passed away last year, Axen was asked to sing at the funeral. But Axen never expected to be named Nurse of the Year by “The Doctors.” The honor was a complete surprise.